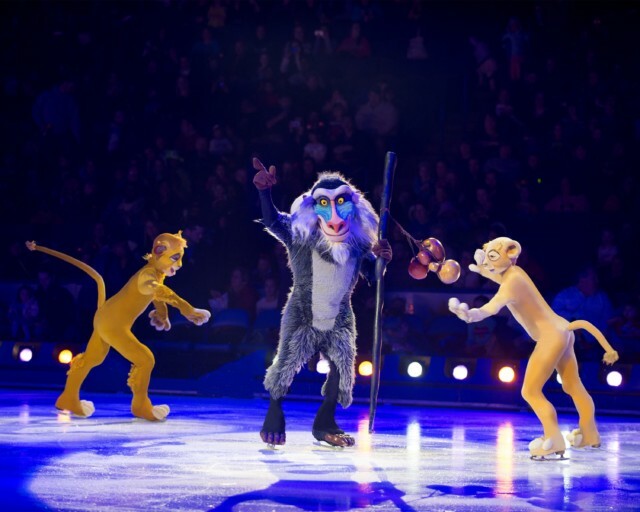 We booked Disney on Ice as a post Christmas treat for the kids, knowing we would have lots of house guests over the festive period and hoping it would give us a bit of time as a family. I don’t take the children into London often even though we are quite close, so it was a very special day out for them. The journey into Waterloo was straightforward although train tickets for the family cost us £80!! From there we got the Jubilee line straight to North Greenwich where to O2 is. I was a bit nervous about taking Charlie ( 8 months ) with us, but the travelling was super easy, so I would definitely do it again. Once at the O2 there was a small queue to get our bag x-rayed and then electrical items and tickets checked, but the process was very efficient and it didn’t take long at all. We went to the toilet before we sat down ( no queue ) and got ready for the show. The main show began with the well known and much loved It’s A Small World song which we knew from the ride in Disney World, Florida. The skaters were phenomenol, we sat there completely transfixed and even baby Charlie smiled when Mickey, Minnie, Donald, Daisy and Goofy appeared to tell us about the adventure ahead. The adventure started in Africa and included some of our favourite Lion King songs and much loved characters including Simba, Pumbaa and Timon. Mickey then took us to London to the Darling’s house. 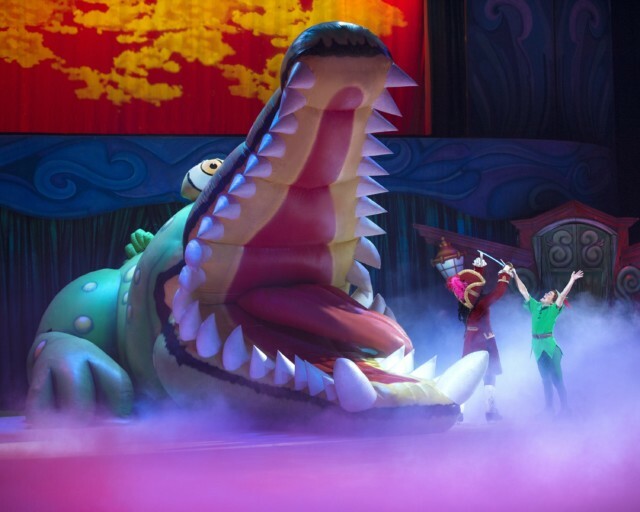 If I’m completely honest this bit felt a little long, but despite that, we throughly enjoyed the retelling of the Peter Pan story with the highlight being a giant inflatable crocodile gobbling up Captain Hook. After a short interval we went for a trip under the sea with The Little Mermaid. This is my all time favourite Disney film so I was thrilled to see it included. We danced along to the much loved soundtrack and booed when a giant Ursula came along. The final act was Frozen. 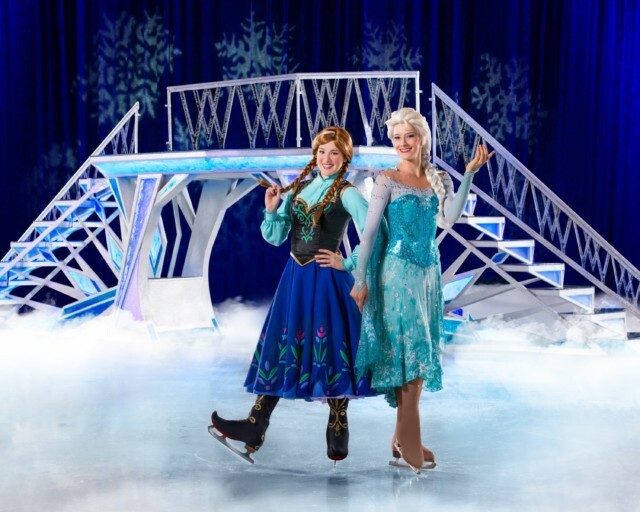 My 10 year old son pulled a face, but even he was impressed by the staging and skating while my daughters watched transfixed as Elsa and Anna twirled and jumped around the ice. The whole act was incredibly well put together. We loved every second. There were lots of babies in the audience and the music and general background noise was quite loud, so no one would really notice if a baby cried, but I did feel very conscious of disturbing other people’s enjoyment of the show. However there was so much going on that Charlie was happy to watch most of time and even fell asleep at one point, so having him there was fine. I’d recommend taking a baby carrier, just because it made getting around with him a lot easier and the tube was very busy as we left. There were lots of novelty and food items available at the venue, but be warned, they are quite pricey. All in all we had a great family afternoon out and would definitely recommend a Disney on Ice adventure for the whole family. A big thank you to Disney on Ice for inviting us! It was definitely a great show!